This article deploys an app to App Service on Windows. To deploy to App Service on Linux, see Create a Node.js web app in Azure App Service on Linux. Azure App Service provides a highly scalable, self-patching web hosting service. 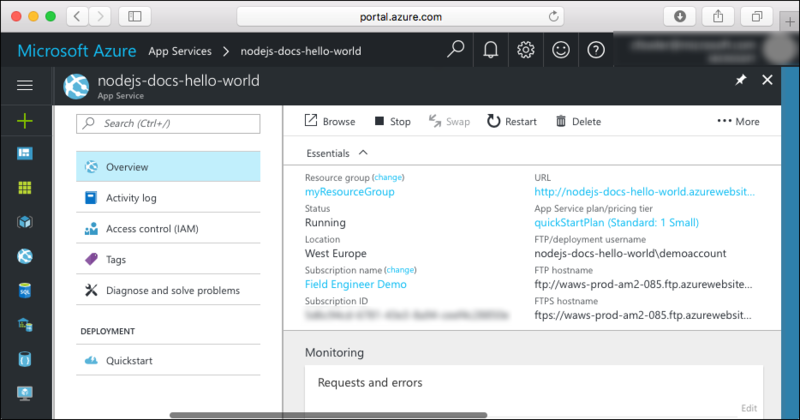 This quickstart shows how to deploy a Node.js app to Azure App Service. You create the web app using the Azure CLI, and you use ZipDeploy to deploy the sample Node.js code to the web app. You can follow the steps here using a Mac, Windows, or Linux machine. Once the prerequisites are installed, it takes about five minutes to complete the steps. Download the sample Node.js project from https://github.com/Azure-Samples/nodejs-docs-hello-world/archive/master.zip and extract the ZIP archive. App Service injects process.env.PORT into your application, so the code uses the variable to know which port to listen. In a terminal window, navigate to the root directory of the sample Node.js project (the one that contains index.js). Run the application locally so that you see how it should look when you deploy it to Azure. Open a terminal window and use the npm start script to launch the built in Node.js HTTP server. Open a web browser, and navigate to the sample app at http://localhost:1337. You see the Hello World message from the sample app displayed in the page. In your terminal window, press Ctrl+C to exit the web server. In Azure App Service, the app is run in IIS using iisnode. To enable the app to run with iisnode, the root app directory contains a web.config file. The file is readable by IIS, and the iisnode-related settings are documented in the iisnode GitHub repository. Later, you upload this ZIP file to Azure and deploy it to App Service. In the Cloud Shell, create a resource group with the az group create command. The following example creates a resource group named myResourceGroup in the South Central US location. To see all supported locations for App Service in Free tier, run the az appservice list-locations --sku FREE command. In the Cloud Shell, create an App Service plan with the az appservice plan create command. In the Cloud Shell, create a web app in the myAppServicePlan App Service plan with the az webapp create command. In the following example, replace <app_name> with a globally unique app name (valid characters are a-z, 0-9, and -). Set the Node runtime to 10.14.1. To see all supported runtimes, run az webapp list-runtimes. Browse to your newly created web app. Replace <app_name> with a unique app name. In the browser, navigate to https://<app_name>.scm.azurewebsites.net/ZipDeployUI. Upload the ZIP file you created in Create a project ZIP file by dragging it to the file explorer area on the web page. When deployment is in progress, an icon in the top right corner shows you the progress in percentage. The page also shows verbose messages for the operation below the explorer area. When it is finished, the last deployment message should say Deployment successful. Browse to the deployed application using your web browser. The Node.js sample code is running in an Azure App Service web app. Congratulations! You've deployed your first Node.js app to App Service. In the local terminal window, navigate to your application's root directory, create a new ZIP file for your updated project. Deploy this new ZIP file to App Service, using the same steps in Deploy ZIP file. Switch back to the browser window that opened in the Browse to the app step, and refresh the page. 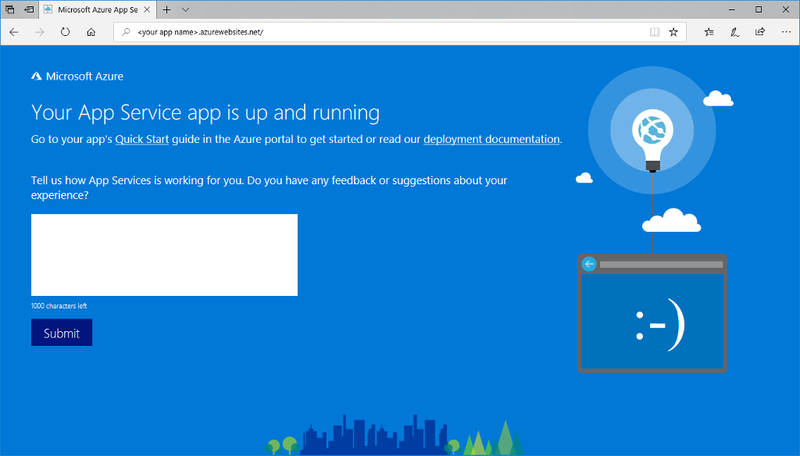 Go to the Azure portal to manage the web app you created. From the left menu, click App Services, and then click the name of your Azure app. You see your web app's Overview page. Here, you can perform basic management tasks like browse, stop, start, restart, and delete. The left menu provides different pages for configuring your app. This command may take a minute to run.